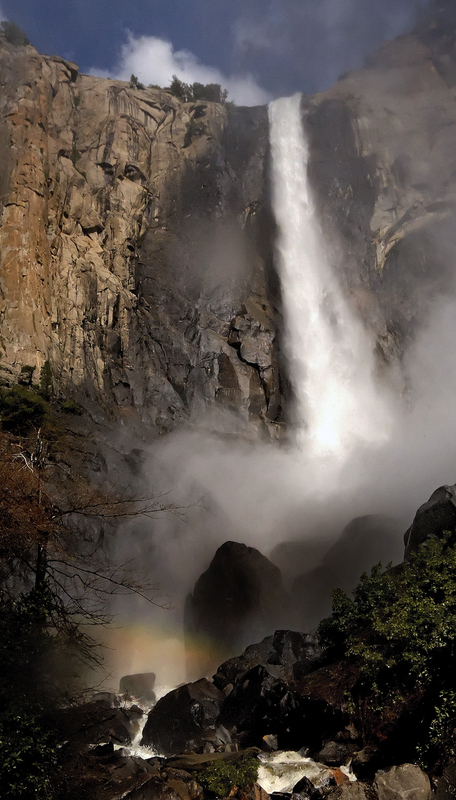 This is a picture of Bridalveil Falls in Yosemite National Park (USA) taken during the Spring runoff when waterfalls are the most spectacular. Many shied away from this location as the mist from the falls was so intense, it meant an immediate soaking from head to toe even 50 feet away. At the base of the falls, we composed the image and adjusted exposure, turned our backs to dry the equipment and then quickly spun around to get the shot. It was exhilerating…and fun watching the expressions of people as these two soaked photographers merrily returned from where others dared not go. Climb Me - I dare you! 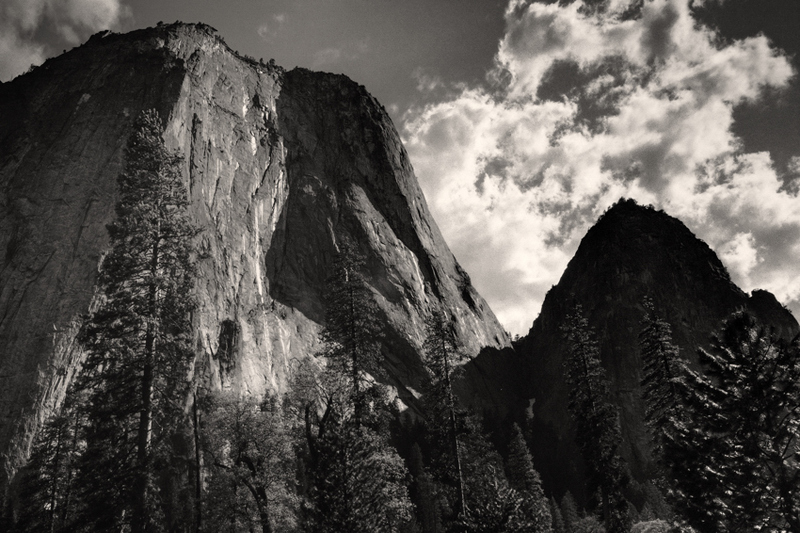 This was shot from the Yosemite Valley up at the famous El Capitan. We saw a bunch of brave (or crazy) climbers making the ascent, often taking 2-3 days, scaling the sheer face, sleeping while suspended. I finally found something that my Wife would NOT do, although she is more than willing to jump out of a perfectly functional airplane! El Capitan is a 3,000-foot (910 m) vertical rock formation located on the north side of Yosemite Valley, near its western end. The granite monolith is one of the world’s favorite challenges for rock climbers. 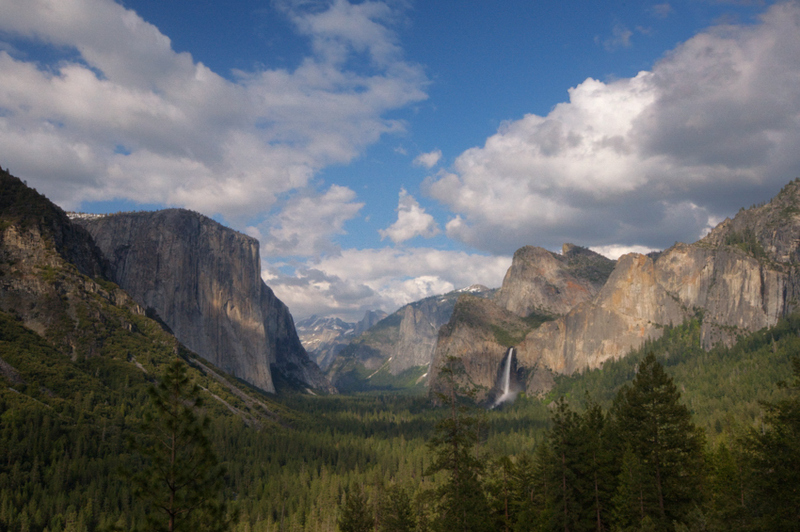 A previous post shows its relationship to the Valley (The Tunnel View). 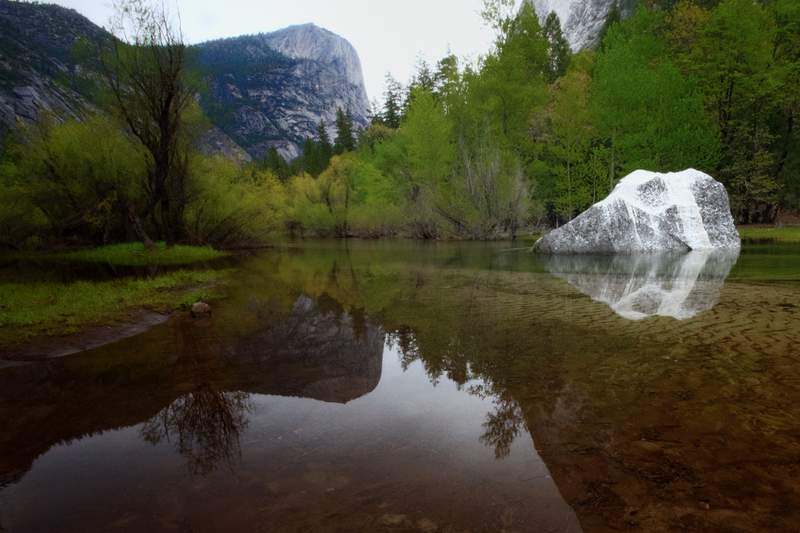 This is the violent spring run off from the seasonal Mirror Lake in Yosemite National Park in California. We had to do a bit of scrambling along slippery rocks to get close to the icy water. Falling in would have been a problem due to the volume of water. Mirror Lake has little water much of the year, but in spring and early summer it can grow in size. When water is calm, the lake offers beautiful reflections of surrounding cliffs. Exhibits detail the story of the area’s lake-to-meadow succession. This can be a good place to spot wildlife. See a previous post of this tranquil lake compared to its violent creek. This was taken in The Mariposa Grove, home to the, Sequoiadendron giganteum. The oldest Giant Sequoia may exceed 3,000 years and top out at a height of around 290ft. It is truly difficult to capture the majesty of these beautiful trees! Into the grove on the main trail is the Fallen Monarch. Perhaps you’ve seen this tree before—in the famous 1899 photograph of U. S Cavalry officers on their horses up on top! Tannic acid in the wood suppresses the initial growth of fungi and bacteria, essentially arresting decay. Only when rain and melting snow have leached the tannin from the wood can decay begin. Biologists suspect that this tree had been down several hundred years before the Cavalry photograph was taken! Notice the roots of this tree. 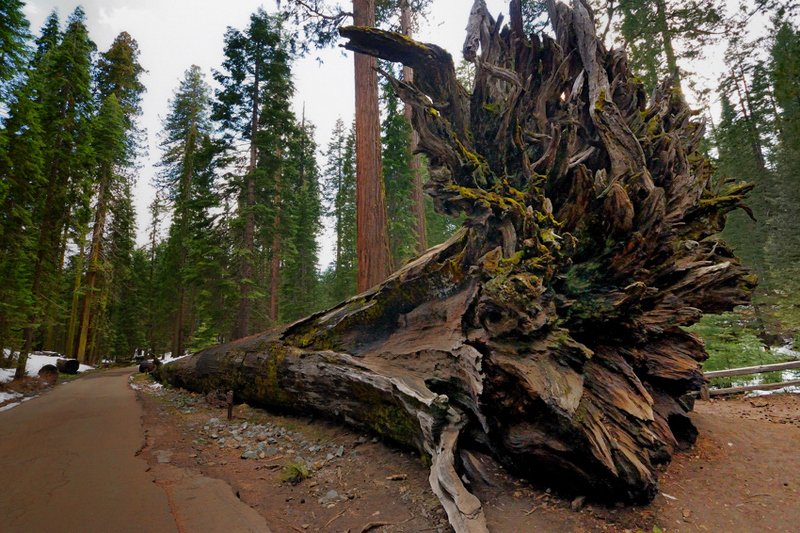 Sequoia’s don’t have deep tap roots; instead, the roots spread out near the surface to capture water. While the roots are usually no deeper than six feet (2 meters), they fan out more than 150 feet (45 meters), providing a stable base to balance the massive trunk. This is a shot of Bridalveil Falls Bridge No. 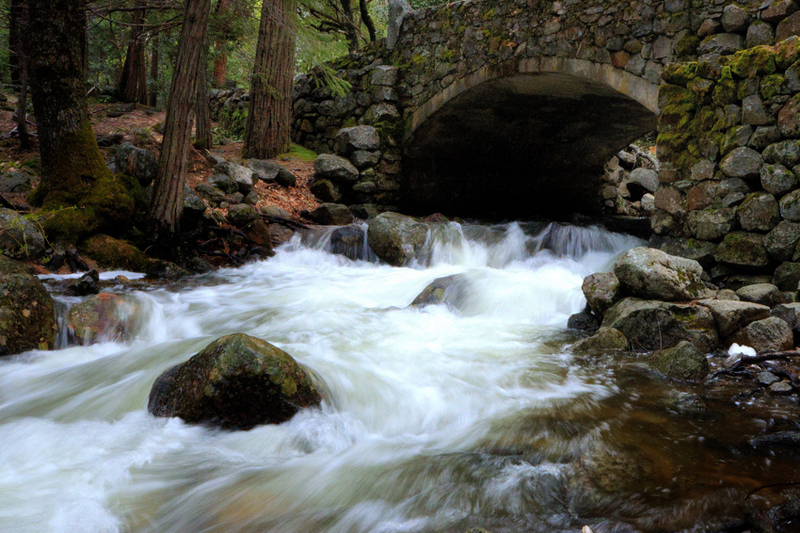 3, Spanning Bridalveil Creek on carriage road, Yosemite Village, Mariposa, CA. This is several hundred meters downstream from the base of the Falls. This was taken first thing in the morning – we had at this time decided to return to the Falls later in the afternoon to take advantage of the setting sun on the thundering waters. Even at this distance, you will likely be quite well “misted” and getting to the Falls viewing platform will leave you soaked…bring a few dry lens cloths if you plan on taking some pictures. There are three Bridalveil Falls bridges. They represent the only surviving road bridges in the park dating to the administration by the U.S. Cavalry from 1890-1914. They also represent the first use of reinforced concrete in bridge construction in the park. This was taken after a short hike up the Tenaya Creek to an elevation 4094ft. May is the perfect time to visit Yosemite. 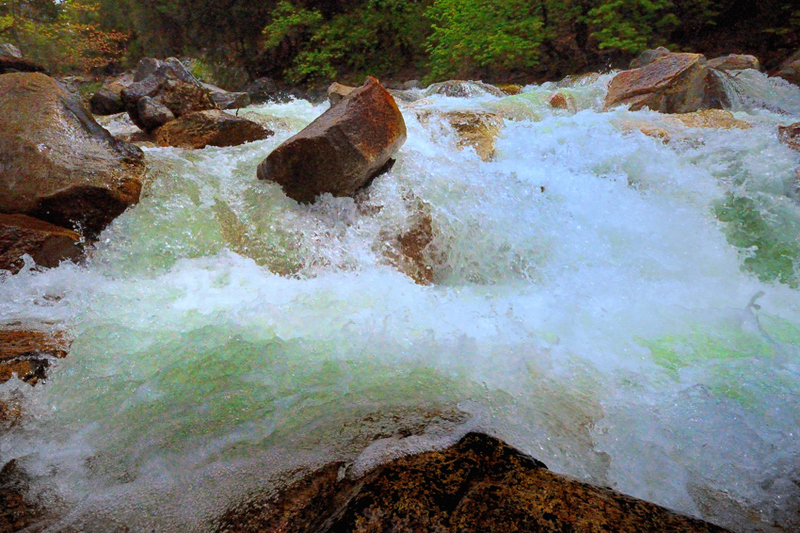 The Spring runoff produces spectacular waterfalls, very few bugs and just before the start of the tourist season. 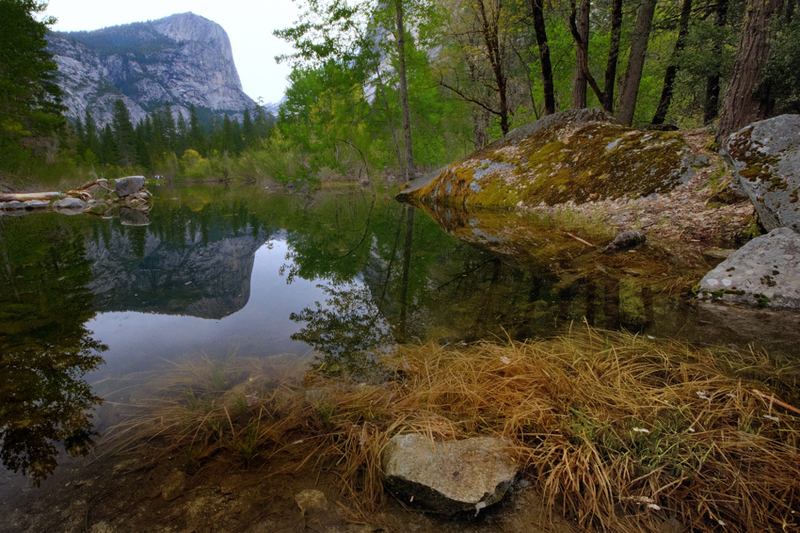 Mirror Lake is a small, seasonal lake located on Tenaya Creek in Yosemite National Park. Situated in Tenaya Canyon directly between North Dome and Half Dome, it is the last remnant of a large glacial lake that once filled most of Yosemite Valley at the end of the last Ice Age, and is close to disappearing due to sediment accumulation. We had a look at this vista early in the morning and decided to return later during the day to allow the sun to paint the west-facing slopes. This is a view of the Yosemite Valley, showing El Capitan and The Bridalveil Falls.